When the snow falls around Turpin Meadow Ranch, the world develops an icy tranquility, becomes even more quiet and cozy, and the animals venture out of their dens around the ranch searching for food. Our chef prepares special winter recipes. And our grounds staff starts grooming our more than nine miles of ranch Nordic trails for White season activities, like snowshoeing. And if you’re planning on exploring the winter wonderland of the ranch or surrounding areas while strapped into one of the oldest ways to traverse snowfall, you will want to make sure to put together the ideal gear for the activity. Luckily, most of the gear used for snowshoeing is gear that can also be used at other winter sports, so if you’re also planning on Nordic skiing, fat biking or snowmobiling, you can repurpose a lot of what you bring. As with all winter outdoor activities, layering is the most critical. Your base layer should keep you warm, but also wick away moisture. A fleece or woolen mid layer will provide insulation to maintain warmth even in the coldest conditions, and it can be removed if you grow too warm. A waterproof, but breathable exterior layer is the final step. Breathability is key; trapping moisture near your body will cause you to become chilly or even trigger hypothermia. A good set of layers will help you keep warm and dry. While strapped in the snowshoes, your feet will still mostly be in contact with the snow and subject to cold and moisture. Warm, comfortable, waterproof hiking boots are essential. Thick, warm socks in a moisture-wicking fabric are best; Smartwool or Ausangate socks are two top brands. If you will be traversing through deep or powdery snow, it would also be good to invest in a pair of gaiters, especially if you are not wearing snow pants. 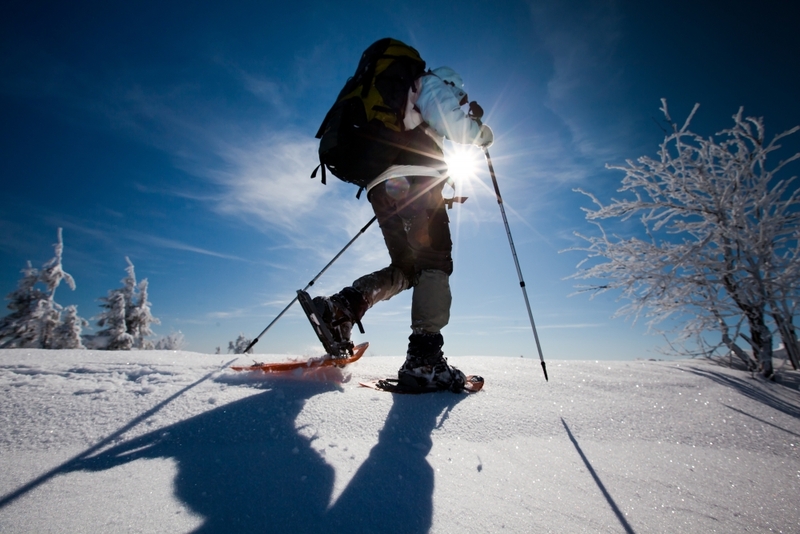 Although poles are not necessary for snowshoeing, they are recommended for balance and leverage. Although some use ski poles, telescoping poles are a great choice because they are adjustable in length and pack away when not in use. With snowshoes, there are many different types for varying levels and activities. There are even combination Nordic ski/snowshoes (“Skishoes”). It’s a great idea to start out by renting different types of shoes until you get a sense for what type suits your style and activity, such as steep terrains, trails, and deep powder. If you decide to buy, be sure to research and check opinions with sales consultants before making a decision. 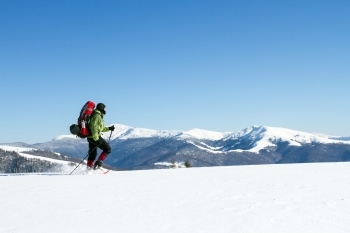 The same types of accessories you might use for skiing are applicable for snowshoeing: a warm hat, ear coverings, a face covering (in extreme cold or wind), and waterproof gloves. A warm inner fleece or woolen glove is also recommended. One thing many people overlook in winter weather is eye protection. Winter in the mountain west is often sunny, but even in overcast conditions, the light can glare off snow and make visibility difficult, or even cause eye damage. UV-protection sunglasses are probably adequate; polarized sunglasses are better. In very cold or windy conditions, ski goggles may be the best idea. Although the trails on the ranch are groomed, when you venture out on your own into backcountry or non-groomed trails, safety gear is recommended. GPS locators and beacons that operate independently of mobile networks are highly recommended. Avalanche probes are good to help determine path safety. Compactable shovel and avalanche snorkels are also a good idea if you are entering areas with potential hazards. When you’re coming to Turpin Meadow Ranch for white season adventures, our trails have a small one-time use fee for overnight guests. (Breakfast and dinner are free for overnight guests.) Day passes—and breakfast, lunch, and dinner meals—can also be purchased (day guests, please call ahead for dinner reservations). We looking forward to seeing you by the fire in the lodge after you’ve spent the day exploring!